Content Pages are a great way of distributing your school information and policy documents to students and staff. Existing content can be edited or new content can be added at any time. To view how Content Pages appear in the staff and student eDiary, click on 'eDiary' in the top black menu bar. Then click the Content Pages icon on the left side. You will then be presented with a list of the Content Pages in your eDiary. Click on the link for the page to view it and use the previous and next buttons to cycle through the pages. The ' Welcome', 'Term Dates', and 'Staff Details' Content Pages are automatically generated by the eDiary based on information entered in the Settings area. Refer to our School Settings and Term Dates Knowledge Base articles for more information. Public Holidays will only display if they fall within the given Term dates. To make changes to Public Holidays please contact the MyEDiary Customer Success Team. 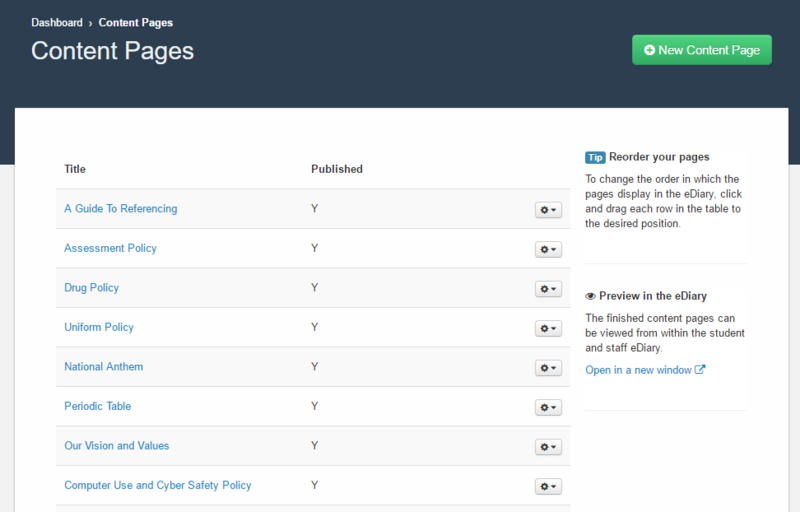 To add a new Content Page or to make changes to an existing one, click on the Content Pages icon from your dashboard. Click the 'New Content Page' button to add a new Content Page. Change the order in which the pages display in the eDiary by clicking and dragging them to a different position. Edit, Delete, or Preview an existing Content Page from the option menu to the right of each page. The title of the page - this appears in the top banner. The actual content of the page. Use the rich text editor to format text and tables, and to add images, video, and file attachments. We can host your videos on our Wistia account. This avoids issues with YouTube such as access restrictions and videos linking to inappropriate content. Contact the MyEDiary Customer Success Team to arrange this. Untick this box to hide this Content Page from student and teacher eDiaries (for seasonal pages or pages you are working on that are not complete). 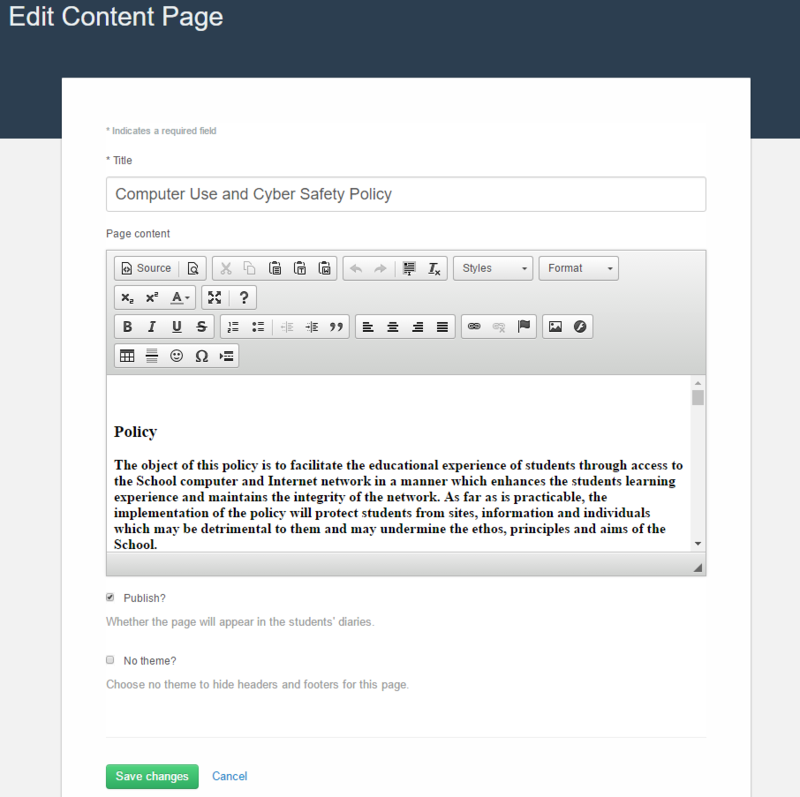 Prevent the title banner, school motto, and footer art from displaying on this Content Page. Be sure to always preview the content of your page - there can be slight differences between what is shown in the edit screen and what displays in the eDiary.